Defeatism and carping should not distract from the necessary party reform that Rahul Gandhi has taken on. The writer is a Supreme Court lawyer, a former legislator in Andhra Pradesh and a senior Congress party member in Telangana. Each day, anonymous quotes by “senior” Congress leaders fill the newspapers, holding Rahul Gandhi and his core team of young advisors culpable for the party’s electoral defeat. The ascent of Narendra Modi represents the most significant challenge to Indian pluralism since the foundation of the Indian republic. Modi is being applauded for carrying the BJP to power with an absolute majority in the Lok Sabha. Yet it’s important to remind ourselves that there isn’t a single Muslim among the 282 BJP MPs: India’s largest minority has no representation in the ruling party. Committed doctrinally to privileging one set of Indians at the expense of all others, the BJP invites constant invigilation in government. The task of protecting the Indian Constitution from potential Hindutva onslaughts rests with the opposition. And for all its manifest failures in government, the Congress party remains the sole national opponent of the BJP. Its ideology, particularly on the question of identity, is antithetical to the BJP’s. Even at its weakest, the Congress remains a poster child of religious pluralism: its emaciated congregation of 44 MPs contains representatives of every major faith. But instead of recalibrating itself for the onerous new responsibility ahead, the Congress is, in the name of “accountability”, playing to the benefit of its rivals. The clamour for accountability — which is a barely disguised demand for the attenuation of the Gandhis’ prominence in the party — has come primarily from those who cheered on Modi’s rise. More dismaying is the carping within the Congress. Each day, anonymous quotes by “senior” Congress leaders fill the newspapers, holding Rahul Gandhi and his core team of young advisors culpable for the party’s electoral defeat. Rahul, we are told, was “misled” by his team into making all the wrong choices. Some argue that access to the leadership was restricted by Rahul’s “coterie”; others claim that the counsel of senior leaders was neglected during the distribution of tickets to make way for political unknowns. But read closely, and you notice that the criticism now being directed at Rahul and his team has little to do with imposing accountability. If anything, its purpose is to forestall meaningful introspection for superficial displays of self-correction: put on a grave face, blame a handful of energetic young advisors in Delhi for a countrywide drubbing whose causes are manifold, and return to business as usual. As such, the attempt to scapegoat individuals is the work of disgruntled old Congress hands petrified by the reform of the party initiated by Rahul and overseen by his team. After all, for all the epithets hurled at him by critics who see him as a “prince”, Rahul Gandhi’s most significant achievement within the Congress has been to place it on an irreversible path to democratisation. The irony of his leadership is that he has wielded his apparently unquestioned authority to dilute his own hold over his inheritance. Consider, for instance, the ordinance promulgated hastily by the Union cabinet to exempt legislators convicted in criminal cases from disqualification. It enjoyed the broad support of major partners in the UPA, who saw it as a vital insurance policy that protected tainted but bankable politicians from judicial elimination. 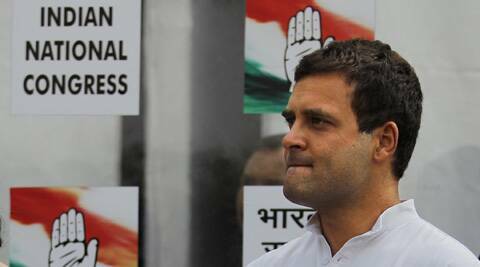 Rahul Gandhi’s brusque intervention killed off the profoundly anti-democratic ordinance. This seemingly imperious intervention embarrassed the Congress and confounded its critics — but if it was indicative of the Gandhis’ authority in the party, it was evidence also of Rahul’s ambition to deploy that authority to make politics transparent and politicians answerable. The Congress party’s greatest asset is its expansive and deep-rooted organisational network: it has a presence in virtually every hamlet of the country. But for too long, this formidable political machine, built during the freedom struggle, was left to decay by the party’s numerous regional and national leaders who, neglecting ordinary workers, sought to erect structures of patronage around themselves. Rahul, upon being elected vice president of the Congress last year, resolved to rescue the party from obsolescence by opening it up to its deserted workers. Panic swept through the old guard as the new vice president, aided by a nonpartisan team of advisors, initiated a drive towards modernisation. This was followed by the proposal to democratise the distribution of party tickets by implementing US-style primaries across India — a tremendous boost to internal democracy, but also a direct threat to those who profited from entrenched structures of patronage within the Congress. The party’s decimation in the general elections has suddenly invigorated all those who feared a marginal future in a reformed Congress. But to pronounce the renovation inaugurated by Rahul Gandhi a failure because the Congress did not secure adequate seats in the general elections is to mislead the public about its purpose — it was intended to make the Congress gradually fit for the 21st century, not to yield immediate electoral dividends. The BJP’s triumph is the culmination of a six-decade-long struggle to build a nationwide organisation; the Congress’s decline, on the other hand, is the consequence of a prolonged neglect of its health by its many custodians. This is the imbalance that Rahul Gandhi’s reforms are designed to fix. To halt them now would be to sacrifice long-term gains for the mere impression, in the short-term, of accountability. Now, more than ever, India needs a competent opposition in Parliament. The immediate task ahead for members of the Congress is to unite behind the leadership. And for those outside, rather than insisting on a Congress sans the Gandhi family, it might serve us better to be realistic — to accept that abrupt change cannot come easily to an old and obstinate beast like the Congress, and that the party’s top-down nature may impose discipline on its ranks and save it from imminent extinction as Modi assumes charge. This can only be good for India: a united Congress can defend us more ably from majoritarian assaults than a fractured entity ever could. The Congress, severely pulverised, needs urgently to cease playing to the advantage of its adversaries and regroup. If it does not, the loss will be India’s: at stake is the very idea of India.